The new director of the National Institutes of Health (NIH), world-renowned geneticist Francis S. Collins, has been making public statements in major national forums that communicate a positive view about the importance of basic social and behavioral science to improving the nation’s health. This has given ASA encouragement that our congratulatory letter regarding his appointment as the 16th director of the nation’s premiere medical and health research agency would be well received, and that we would find an attentive reader for forthcoming suggestions from ASA and our sister social science societies. This community greatly appreciates Collins’ informed views about our scientific contributions to the work of a politically and publicly popular agency providing $30-billion in taxpayer money for basic health and wellness research. The question was only whether actions would follow. goals relative to the health of Americans. Social scientists from NIH as well as from ASA’s leadership (e.g., see Sept./Oct. 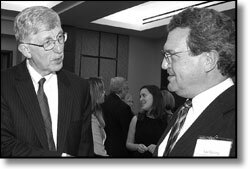 2004 Footnotes "Profile of the ASA President," p. 1) and staff have worked persistently and successfully over the years to cultivate in scientists such as Collins a growing appreciation of the value of social sciences to the NIH mission. When Collins headed NIH’s National Human Genome Research Institute (NHGRI), for example, he was receptive to the importance of the work of sociologist Troy Duster on DNA and race. As recently as this month, in a speech at the National Press Club, Collins expressed his pride that the only new program at the NHGRI in the last 10 years was devoted to social science—the Ethical, Legal and Social Implications (ELSI) Research Program. At the end of Collins’ Press Club speech, which was filmed by C-Span and webcast, the host posed an ASA-submitted question: "Given that research shows that about 50 percent of premature deaths in the United States are directly attributable to social and behavioral determinants (e.g., health-care disparities, personal life choices regarding exercise, tobacco smoking, alcohol use, environmental effects on obesity), what leverage points in NIH-supported basic social and behavioral research does Dr. Collins see using to reduce this percentage?" Collins gave a welcome response. He acknowledged "very substantive" points of leverage for NIH-supported social and behavioral research for prevention and treatment. He referred to OppNet (see January 2010 Footnotes "Science Policy," p. 3); the centrality of social and sociological questions in the new NIH Common Fund’s $4-million "science of behavior change" research program; the ELSI program; the role of social and physical environments on obesity; and the work of the Office of Behavioral and Social Sciences Research (OBSSR), which reports directly to him. Within a month of assuming the NIH directorship, Collins convened a first-ever town hall meeting with the stakeholder science and policy communities (e.g., scientific societies, healthcare associations, healthcare policymakers) on the NIH campus outside Washington, DC. Collins urged the 500 representatives from constituent organizations to send him comments directly through the new "NIH Listens" online comment submission system. ASA has used this channel to convey specific research ideas and general social science concerns. We also took the opportunity to hand deliver the ASA comments to him at the Press Club event. Collins’ priorities for NIH include research on the rapid technological advances in genomics and computational biology to understand fundamental biological processes underlying disease; promoting translational research (i.e., moving more quickly and efficiently from basic "bench" research to "bedside" applications); emphasizing global health; cultivating young scientists; informing healthcare reform efforts with careful comparative effectiveness research; and tackling disparities in healthcare and health across racial and ethnic groups. His comments at the December announcement of NIH’s new program "Translating Basic Behavioral and Social Science Discoveries into Interventions to Reduce Obesity" reflect an understanding of the strategic importance of sociology. One of the most notable achievements to date of Collins’ directorship is the new Basic Behavioral and Social Science Opportunity Network (OppNet), a five-year $120-million initiative. This trans-NIH initiative to expand Institutes’ and Centers’ funding of basic behavioral and social sciences research (b-BSSR) will undoubtedly advance health research for decades because it recognizes the centrality of social issues in combating illness and achieving health. Another significant early achievement was Collins’ decision to make additional embryonic stem cell lines available for federal research funding. ASA is vitally interested in interdisciplinary work that rests on genetics and social science. The sociological research community has been highly supportive of OppNet since its earliest beginnings at OBSSR because it promises a system-wide, intellectually integrative approach for tapping the power of social and behavioral research at NIH. Some advocates had instead proposed confining social and behavioral science within NIH’s National Institute of General Medical Sciences (NIGMS), but this was resisted successfully by others as potentially isolating these sciences from the growing capability of active integration with other scientific efforts within NIH. In contrast to weaker silo-like models of scientific disciplines, coordinating OppNet through OBSSR is a fresh approach that will undoubtedly benefit b-BSSR. Because nature abhors disciplinary boundaries, so to speak, the wisdom of OppNet’s dynamic model of science reflects an intellectual leap forward toward disciplinary conciliation and effective integration of social science into NIH research portfolios. Social and behavioral processes, mechanisms, and systems can control, modulate, and/or mediate health and illness in complex and dynamic ways—as do genetic, cellular, molecular, and physical processes. Francis Collins’ comprehension of this complexity appears to be providing him with an early advantage in understanding the power of social science. Sally T. Hillsman is the Executive Officer of ASA. She can be reached by email at executive.office@asanet.org.